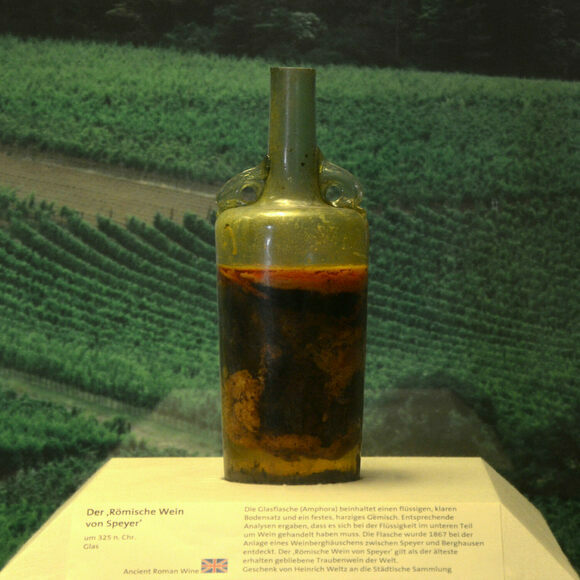 Aged nearly 1,700 years, the world's oldest bottle of wine is probably still drinkable. At nearly 1,700 years old, the world’s oldest bottle of wine puts even the most mature Bordeaux to shame. When a team excavated a Roman couple’s tomb near the city of Speyer, Germany, in 1867, they discovered several bottles, but only one—now known as the Speyer Wine Bottle—still contained liquid. Dating back as early as 325 CE, the wine has evolved from what was likely a blend of local grapes, herbs, and olive oil into a dark, resin-like mass and cloudy liquid. And just how did this liquid keep while others from the era evaporated? It’s all thanks to the wax seal and the large amount of olive oil, which helped further seal the liquid off from air. To witness the effects of such extreme aging up close, you can see the Speyer Wine Bottle at the Historical Museum of the Palatinate in Speyer. As you take in the dolphin-shaped handles, green-yellow glass, and murky, layered contents, try imagining how it might taste. While it’s no longer alcoholic, researchers have said that it is still probably safe to drink. Not that anyone is planning on pouring a glass anytime soon: Museum curators have kept it sealed to avoid disturbing the miraculously preserved liquid. The vineyards of Mount Vesuvius still produce the same wines enjoyed by the ancient Romans. The liqueur was created “to stimulate and revivify His Majesty” while he was driving.